I think we kitties are very closely related to owls... maybe because we are both very wise! I think you look wiser than the owl ! The eyes may look the same, but they look better on you, Daisy. Wow Daisy! That is more than a passing resemblance, and we know you are as wise as an owl. Some resemblance there, Daisy...but yours are prettier! Daisy, you DO have owl eyes..OR...the owl has Daisy eyes! Daisy the owl. Wow, that is unreal how your eyes look so much like the owl. So you are a wise kitty. Take care. You're definitely prettier, Daisy. But both your eyes and those owl's eyes are amazing! wow Daisy, chérie...How did you do that? Very impressive eyes! I agree with Kjelle, you are a wiser girl! I think the owl looks much meaner than you ever could Daisy--even if you were giving your angry look at Harley. 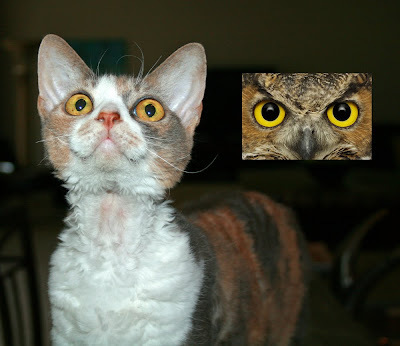 You look just like the owl - without the hooke beak and without the feathers. There is quite a resemblance there. Daisy your eyes are more gentle than the owl's eyes probably 'cause you don't have to hunt mice...you can get Harley to do that for you!! Who? Who? Harley!! yes indeedy...your eyes are very similar to owl eyes! Those are great owl-eye, Daisy! We wonder which of you sees better at night? WOW Daisy. Who would have thought that you had eyes just like an owl. Oh I almost forgot. Since you have owl eyes can you answer the question about how many licks it takes to get to the center of a tootsie pop? I love owls!!! I love you Daisy! You have very pretty owl eyes! I agree with Sparkle. Cats are very wise. I'm quite certain that we are the smartest of all the animals. Not to mention the best looking. the similarity is striking. i'll bet you could swoop down on an unsuspecting mouse in the dark just as good as an owl. But you are way smarter than any owl, Daisy! We think you are far prettier! Your pretty eyes are so much sweeter, like your little smile.